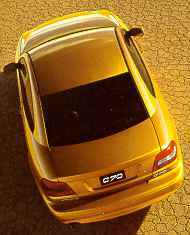 The Volvo C70 Coupe is a car engineered for pure pleasure and enjoyment. A full four-seater with the stunning lines of a sports coupe, yet all the refinement of a prestige saloon. A car for the senses. The interior specification and quality are pure indulgence. Co-ordinated colourways blend wood trims with exclusive leather and fabric upholsteries. A multi-speaker audio system envelops the senses. Driving satisfaction is overwhelming. Turbocharged engine performance accelerating from 0-62mph in 6.9 seconds, if needed. A choice of three different chassis types, each tuned to deliver absolute control. Anti-lock braking with ABS. With Volvo, there's the added assurance of driving pleasure with responsibility. Award-winning safety systems. Environmentally influenced design. A responsive dealer network. Worry-free ownership. 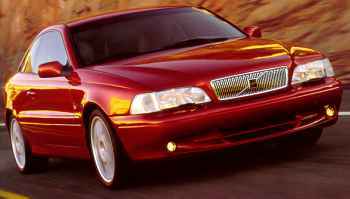 Each C70 is exclusively built to order by Volvo. 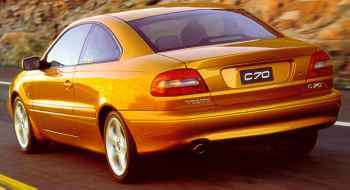 The C70 is designed for sensual driving pleasure. The exterior lines excite and invite. The interior environment soothes and satisfies. Quality is everywhere. The passenger accommodation is ultimately luxurious. Seats are contoured and sculpted for comfort, with ample space in the rear for two adults. Access is easy. As the backrest is tilted forwards, the seat's base advances, too. The gently swept dashboard places instruments clearly and logically. Reach for any control and you'll find its feel tactile and operation positive. Attention to detail is absolute. Controls like the electric mirror joystick, fuel cap release and boot release mechanism are conveniently recessed in the driver's door. The new Thatcham approved alarm and locking system is remote operated. But enjoying life means protecting it, too. Every C70 includes three-point inertia reel seat belts, side airbags on the front seats, Volvo's SIPS side impact protection system and a driver's airbag. Leather seats. A choice of rich, polished wood on the dashboard and central tunnel console. An Electronic Climate Control unit (ECC) automatically maintains a set temperature inside the car regardless of the season. Both driver and front seat passenger have individual controls. An electric driver's seat to make shared driving easy. The seat memorises three pre-stored settings. The Information Centre displays time, ambient temperature, average speed, distance covered, current and average fuel consumption and the distance the remaining fuel will cover. A 3-stack CD stereo radio cassette with powerful 4 x 100w amplifier for crystal clear sound. Options let you select one or more items of equipment individually. Your dealer will be happy to provide you with full details of these and other C70 accessories. The Road Traffic Information System, or RTI, literally tells you where to go to arrive at your destination. Using the very latest in satellite navigation, the in-car RTI monitor displays your position on a roadmap with directions. A voice tells you where to turn and when. It can also warn of traffic jams and holdups. The CD-ROM based map software already covers much of Western Europe, with full UK cover expected in 1998. Precision is confidence in the driving seat. The C70's road-hugging handling results in a car that inspires total confidence. The stability stems from a balanced interaction between the rigid chassis, driveline and suspension systems. Delta Link, Volvo's rear suspension system, allows the rear wheels to turn fractionally when entering a corner. In conjunction with the independent front suspension, the wheels maintain optimum road contact. The effect is precise, positive steering response with control throughout the turn. With the 193 bhp engine the C70 features a 'Dynamic' chassis as standard equipment, offering optimum passenger comfort. For the 240 bhp T5, 'Sports' chassis settings and shock absorbers are used, providing a firm yet compliant ride. As an option, a low sports chassis is also available. This reduces road height, lowering the car's centre of gravity and further enhancing handling. The very latest ABS anti-locking braking system maintains optimum steering control and braking efficiency in an emergency. In addition EBD Electronic Brake Distribution - automatically adjusts braking power between the front and rear wheels to deliver maximum braking effectiveness. A choice of two smooth, quiet five cylinder petrol engines, open the door to both unbridled exhilaration and motorway refinement. Twenty valves, double overhead camshafts and sophisticated electronic ignition and engine management systems contribute to outstanding performance and efficiency. An aluminium engine block and cylinder head reduce weight, improving handling and fuel economy. The 2.3 litre T5 engine is turbocharged, producing 240 bhp. The result is decisive, instantaneous acceleration. With a manual transmission, the C70 attains 62 mph in just 6.9 seconds. Torque measures an engine's ability to deliver power. Engine torque is high throughout the T5 engine speed range, making the car willing and responsive to the most demanding driving styles. The 2.5 litre T unit uses a Light Pressure Turbo to develop 193 bhp. Because maximum torque is already available at 1800 rpm, the 2.5T offers swift, effortless acceleration at low speed.